Batman: The Enemy Within is an episodic point-and-click graphic adventure video game developed and published by Telltale Games and distributed by Warner Bros. Interactive Entertainment under its DC Entertainment label. The game is a sequel to 2016's Batman: The Telltale Series, which was based on Bob Kane and Bill Finger's Batman character. Like most Telltale games, the game features a similar episodic format found in other titles (such as Game of Thrones, The Walking Dead, The Wolf Among Us and Tales from the Borderlands). The player controls Bruce Wayne and his alter-ego Batman, with the game evenly split for both characters. The game features a branching narrative, similar to past Telltale games, giving the player options in approaching a situation and having that choice affect later events in the game. If the player had played the previous game, choices made, such as saving certain characters or stopping a criminal, may also be imported, though the game can be played as a standalone title. The game includes action sequences that are resolved similar to Telltale's other games, using quick time events. The series also includes investigation sequences, allowing the player to use Batman's detective skills to investigate areas. Sections of the game also present situations to the player where they may choose to approach as Bruce Wayne or as Batman. Crowd Play, a feature implemented in the predecessor, also returns for The Enemy Within, allowing streamers to let their audience interact with their session with the game. The player once again assumes control of Bruce Wayne/Batman (Troy Baker), a billionaire who secretly fights crime in Gotham. His butler and former legal guardian Alfred Pennyworth (Enn Reitel), Police Commissioner James Gordon (Murphy Guyer), and Wayne Enterprises Chief of Technology Lucius Fox (Dave Fennoy) return to assist Batman in the field. The game introduces "The Agency", a mysterious government organization with its own agenda led by the ruthless Amanda Waller (Debra Wilson). New supporting characters are also introduced, including Special Agent Iman Avesta (Emily O'Brien), one of the Agency's operatives and a fan of Batman, and Tiffany Fox (Valarie Rae Miller), the daughter of Lucius and an employee at Wayne Enterprises. "John Doe" (Anthony Ingruber) and Selina Kyle/Catwoman (Laura Bailey) also return, now members of a group of criminals called "the Pact". Other members of the group include Riddler (Robin Atkin Downes), Bane (J. B. Blanc), Dr. Victor Fries/Mr. Freeze (Matthew Mercer) and Harleen Quinzel/Harley Quinn (Laura Post). Detective Renee Montoya (Sumalee Montano), Reporter Jack Ryder (Robert Clotworthy) and Wayne Enterprises Chairwoman Regina Zellerbach (Lorri Holt) return with smaller roles within the series. New minor characters introduced include Police Detective Harvey Bullock (Keith Szarabajka), Agency operative Vernon Blake (Christian Lanz), international arms dealer Rumi Mori (Keone Young), Riddler's second-in-command Eli Knable (Alex Hernandez), and Stacked Deck patrons Frank Dumfree and Willy Deever (Kirk Thornton and Dave B. Mitchell respectively). 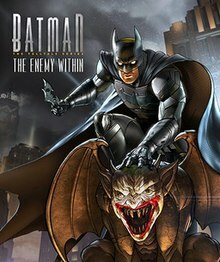 The Enemy Within is set in the same Batman continuity introduced in Batman: The Telltale Series, which took place a number of years into Batman's career. Like the previous installment, the game is set during the mid-to-late 2010s in Gotham City, primarily the Batcave, Wayne Enterprises and Gotham City Police Headquarters. The game also follows the events of the previous game, taking place between a couple of months to a year after these events. While targeting an arms dealer, Batman witnesses the return of the Riddler, one of Gotham's first super-criminals. Confronting the criminal with help from Gordon and the GCPD, he fails to capture him and is assisted by the Agency and their operatives. During their clean up, Batman meets Amanda Waller, the director of the Agency, who takes over the investigation and offers to assist him in tracking Riddler.After returning to the Batcave with a puzzle left by Riddler, Bruce solves it, though is fazed when discovering a signal emitter. When Lucius Fox, the chief of technology at Wayne Enterprises investigates, he is killed in an explosion. At Lucius' funeral, Bruce reunites with former Arkham patient "John Doe", who has been discharged for good behavior. John, having made a number of "friends" after his release, asks Bruce to meet and joined his group, which he refers to as "the Pact". After discovering that Bruce is searching for Riddler, John gives him a lead to investigate in Gotham's East End. After following John's lead and foiling a trap set up, Batman discovers radio wave guided homing missile and realizes that the signal was actually a guide for others. Using further evidence he finds, Batman deduces that Riddler plans to target the Agency, having its agents' phones to produce the targeting signal. After following another lead, he is able to foil Riddler's plan and defeats the criminal. During the arrest, Riddler is shot with a poisoned dart by a mysterious assailant and dies, revealing that he is also a member of the Pact. As the Agency and GCPD arrive, Waller takes over law enforcement in Gotham and reveals to Batman her knowledge of his true identity. Waller suggests that he infiltrates the Pact as Bruce Wayne and gives him an ultimatum: work with the Agency to help arrest the Pact or risk having his identity exposed. Batman responds to an attack on the GCPD's arsenal, where he battles Bane, another member of the Pact, and is defeated. Surviving thanks to help from either Gordon or Waller, Batman decides to follow the latter's advice and meets with John to accept his offer. The two meet at a bar and Bruce is introduced to John's former psychiatrist Harleen Quinzel, now the criminal Harley Quinn. Suspicious of his motives, Harley gives him a chance to prove himself by stealing a prototype electrical skeleton key from Wayne Enterprises, with them joining him during the heist. Despite problems, including an unexpected encounter with Lucius' grieving daughter Tiffany, he is able to get the device to them and an EMP generator. After the show of compliance, Bruce is called to meet the other members, Bane and Mr. Freeze, and convince them to let him join the group. Successful, he joins them to steal a mysterious package from an Agency convoy. After the attack, Bruce learns that the target was Riddler's body and that his former ally Catwoman is also a member of the Pact. After copying Riddler's eyes, Harley reveals one of Riddler's laptops, which he had left in her possession, and gives Bruce the task in finding the location of their true target. Heading to Riddler's lair with John and Catwoman, they solve another death trap and discover the target to be an organization called SANCTUS, which Riddler was formerly associated with. The Pact also begin to suspect a mole, due to the time it took for the job to escalate, and suspicions fall on Bruce. After retrieving Harley's laptop through help from either Selina or John, Bruce finds that the laptop contains evidence of a biological weapon called LOTUS and the location of the lab, where it is being kept. After finding evidence linking SANCTUS to the Agency, Bruce confronts Waller and learns that the former was in charge of experimentation for the latter. After the Pact learn of the lab's location, Bruce is forced to either give himself or Selina up as the traitor, leading to the Pact attempting to execute them. Depending on the decision, Bruce either accompanies them during the heist and sabotages it or escapes from his fate and confronts the group as Batman, possibly with Catwoman's help. Regardless of the choice, Harley betrays the Pact and escapes with the virus, leaving Bane and Freeze to be captured by the Agency. While searching for Quinn, Bruce learns that Project LOTUS was a failed restorative agent, with Riddler being the only known survivor of the experiment. The members of the Pact have planned to use his blood to convert the virus into a healing serum to cure their own ailments. However, Waller has been aware of this plan and plotting to blackmail them into joining the Agency, with the promise of a cure. Unknown to all parties, using even the working version can cause mental problems for the user. After following another lead given by John, Bruce finds him surrounded by agents' bodies. Claiming it to be self defense, John realizes the truth about their "friendship" and reveals his knowledge of Bruce's activities as Batman. Regardless of whether he believes him, Bruce leaves to help the Agency capture a volatile Harley Quinn. Depending on the choices made by the player, John either helps bring her in or arrives to help her escape. Regardless, he detonates bombs placed around the bridge by Quinn and escapes in the ensuing chaos. Several weeks later, John, now known as "Joker", reemerges, now either a vigilante with a twisted sense of right and wrong or a criminal collaborating with Quinn to get revenge on Bruce. The former scenario has Batman briefly working with Joker to fight off the Agency, until he kidnaps and attempts to kill Waller. However, the latter has Joker and Harley terrorizing the city with LOTUS whilst forcing Bruce into a demented game pitting him against his allies. Regardless of the path, Bruce learns that Tiffany murdered Riddler to avenge her father and eventually defeats Joker. Following Joker's capture, Waller orders the Agency to leave Gotham and promises not to reveal Bruce's identity. Returning home, Bruce learns that Alfred has decided to leave him and Gotham, having been struggling with their operations since he was kidnapped and tortured the year before. After a heated discussion, Bruce either decides to leave the life of vigilantism behind to convince Alfred to stay or allows him to leave whilst he continues to operate as Batman. In a post credits scene, Joker is shown to have been returned to Arkham Asylum. Depending on player choices, he is either visited by Bruce or promises to return. All episodes below were released for Windows, macOS, PlayStation, Xbox One, and mobile platforms on the dates given. The Nintendo Switch version was released as a single package on October 2, 2018. Batman: The Enemy Within was considered to be an improvement over its predecessor, earning praise for its story, choices, action sequences, and portrayal of the Batman mythos. However, the presence of technical issues, and Troy Baker's performance as Batman was criticized. The game won the award for "Performance in a Drama, Supporting" with Debra Wilson at the 17th Annual National Academy of Video Game Trade Reviewers Awards, whereas its other nomination was for "Game, Franchise Adventure". Episode 5 was nominated for "Outstanding Achievement in Videogame Writing" at the Writers Guild of America Awards 2018, while the game itself was again nominated at the 18th Annual National Academy of Video Game Trade Reviewers Awards, this time for "Writing in a Drama". The game's portrayal of the Joker particularly stood out for many reviewers, with the player being given the opportunity to try to prevent him from becoming a villain being critically lauded. For example, Scott Maslow from GQ was happily surprised by this version of the Joker and said it managed to make "Batman's most overexposed villain" interesting again: "The Joker has always said his past is multiple-choice, but this is the first time I’ve felt like I was the one checking the boxes." Bradley Shankar from MobileSyrup was especially positive with a review titled "Batman: The Enemy Within offers one of the greatest Joker stories ever told". He explained: "... while there have been numerous great interpretations of the Batman-Joker relationship over the years, there has never been one quite as complex and morally grey as what Telltale has created with The Enemy Within". Tamoor Hussain from GameSpot gave the final episode a 9/10, concluding: "While Telltale's first Batman season stuck a bit too close to established mythos and delivered an underwhelming ending, the second is a memorable Joker origin story that Bat-fans should make a point of playing." Stephanie Chan from VentureBeat was slightly less enthusiastic but still gave the game a score of 80/100 and said: "By the end of the series, I’ll say that Batman: The Enemy Within has tentatively won me over. That’s purely on the strength of the relationship between Batman and The Joker." ^ "Don't forget - the next episode of Batman: The Enemy Within premieres October 3! What are your predictions for 'The Pact?'". Facebook. September 3, 2017. Retrieved October 2, 2017. ^ Meija, Ozzie (September 15, 2018). "Batman: The Enemy Within gets Nintendo Switch release date; Steam sale for Batman Day". Shacknews. Retrieved September 15, 2018. ^ "Batman: The Enemy Within - The Telltale Series for PC Reviews". Metacritic. CBS Interactive. ^ "Batman: The Enemy Within– Episode 1: The Enigma". Metacritic. CBS Interactive. Retrieved May 1, 2018. ^ "Batman: The Enemy Within – Episode 1: The Enigma". Metacritic. CBS Interactive. Retrieved May 1, 2018. ^ "Batman: The Telltale Series – Episode 1: The Enigma". Metacritic. CBS Interactive. Retrieved May 1, 2018. ^ "Batman: The Enemy Within– Episode 2: The Pact". Metacritic. CBS Interactive. Retrieved May 5, 2018. ^ "Batman: The Enemy Within - Episode 2: The Pact". Metacritic. CBS Interactive. Retrieved May 5, 2018. ^ "Batman: The Enemy Within– Episode 3: The Fractured Mask". Metacritic. CBS Interactive. Retrieved May 5, 2018. ^ "Batman: The Enemy Within - Episode 3: The Fractured Mask". Metacritic. CBS Interactive. Retrieved May 5, 2018. ^ "Batman: The Enemy Within– Episode 4: What Ails You". Metacritic. CBS Interactive. Retrieved May 5, 2018. ^ "Batman: The Enemy Within– Episode 5: Same Stitch". Metacritic. CBS Interactive. Retrieved May 5, 2018. ^ "Batman: The Enemy Within - Episode 5: Same Stitch". Metacritic. CBS Interactive. Retrieved May 5, 2018. ^ Sheehan, Gavin (August 11, 2017). "Our Actions Have Consequences: We Review 'Batman: The Enemy Within'". Bleeding Cool. Retrieved October 2, 2017. ^ Moyse, Chris (August 7, 2017). "Review: Batman - The Enemy Within: The Enigma". Destructoid. Retrieved October 2, 2017. ^ "Batman: The Enemy Within - The Telltale Series". GameSpot. ^ "Nominee List for 2017". National Academy of Video Game Trade Reviewers. February 9, 2018. Retrieved February 17, 2018. ^ "2019 Writers Guild Awards Screenplay and Videogame Writing Nominations Announced". Writers Guild of America West. January 7, 2019. Retrieved January 11, 2019. ^ "Nominee List for 2018". National Academy of Video Game Trade Reviewers. February 11, 2019. Retrieved February 20, 2019.